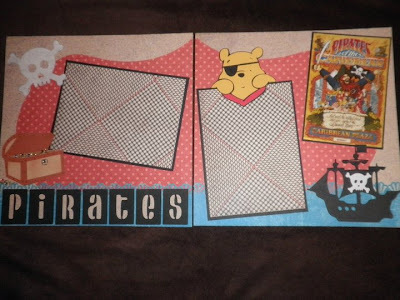 Here is the next page for my 8x8 Disney scrapbook. This is for Pirates of the Caribbean! The lettering is Don Juan. The skulls and pirate ship are from Paper Doll Dress Up. The treasure chest is from Lifes a Beach. Pooh is from Pooh and Friends and I created his eye patch on my Gypsy using an oval and a rectangle. I love how his eye patch looks! I also cut the red background paper out using Gypsy wanderings. Pooh is the cutest pirate I've ever seen!! What a great idea! I can't wait to see whatever it is you come up with next - but go where the ideas are leading!